To improve access to local, sustainable, nutritious food using collaborative research and knowledge-sharing with smallholder farmers, research institutions, and development organizations. We support balanced approaches to natural resource management and community resource rights. Robert Mwanga has spent a career converting the orange-fleshed sweet potato into a tool that can prevent blindness and save the lives of millions of children across Africa. In 2016, the Ugandan scientist and three of his colleagues won the World Food Prize, the highest recognition in global agriculture research, for developing sweet potato varieties high in vitamin A. It was a remarkable achievement and a moment of pride for the staff at The McKnight Foundation, which took a chance on Dr. Mwanga’s audacious vision more than two decades ago to combat malnutrition with a storage root. McKnight recognized early on that researchers in developing countries possessed the talents to solve their pressing needs themselves. More than 40% of preschool-age children and 10% of pregnant women in sub-Saharan Africa don’t get enough vitamin A, according to the World Health Organization. A serious deficiency can lead to blindness and increase the likelihood of a child dying from common afflictions such as diarrhea and measles. This is what Dr. Mwanga proposed in his first grant request in 1994. The timing was perfect. The McKnight Foundation had just launched its Collaborative Crop Research Program the year before. Instead of primarily funding projects led by scientists in Europe and the USA, McKnight recognized early on that researchers in developing countries possessed the talents to solve their pressing needs themselves. In fact, local scientists have an edge when it comes to keenly understanding the nuances of local community needs and cultural attitudes that can make or break a nutritional intervention. “We asked for big ideas and big proposals, but even in that context, Robert’s proposal was hugely ambitious,” remembers Bob Goodman, a member of the crop program’s oversight committee and now the executive dean of the School of Environmental and Biological Sciences at Rutgers University, in New Brunswick, New Jersey. 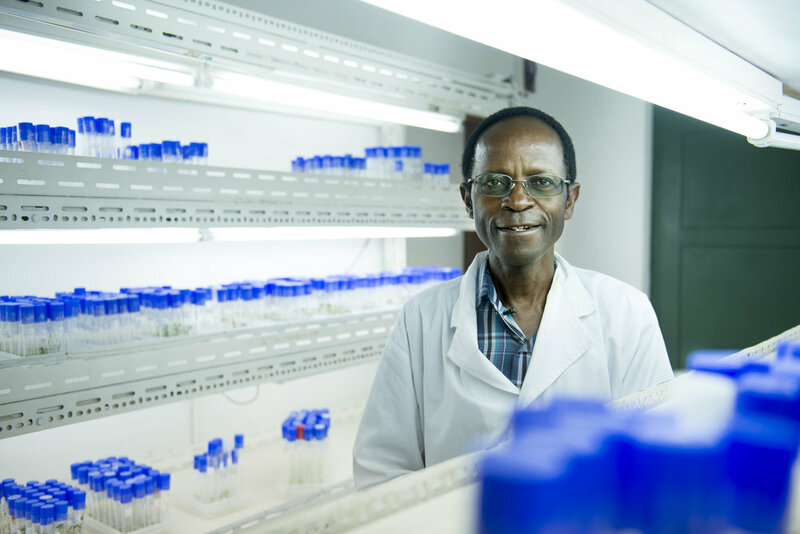 Like many Ugandans, Dr. Mwanga and his 10 siblings grew up eating the starchy roots. His mother planted them alongside cash crops like coffee and cotton on the family’s 20-acre farm in Busota, a town east of the capital city of Kampala. Although relatively nutritious, the dry white and yellow sweet potatoes widely cultivated in Africa have very little or no beta-carotene unlike orange-fleshed varieties common in other parts of the world. Dr. Mwanga aimed to make the orange-fleshed variety more palatable and suitable for wider use. McKnight supported Dr. Mwanga as he pursued a PhD at North Carolina State University in Raleigh, where he worked closely with G. Craig Yencho, a horticulturalist who leads the university’s Sweetpotato and Potato Breeding and Genetics Program. “It wasn’t me telling Robert how to do it,” recalls Yencho. “It was asking, ‘How can I help you?’” As a former Peace Corps volunteer, Yencho routinely saw outsiders come into a country to solve its problems. He sees McKnight’s authentically collaborative approach as a more effective paradigm for international development. After receiving his degree, Dr. Mwanga brought his expertise back to Uganda, where McKnight further supported his work with $2.3 million from 1995 through 2014. Over the years, his team developed more than a dozen new varieties of orange-fleshed sweet potatoes high in beta-carotene, which the body converts to vitamin A. His new varieties also resisted blight and drought, and had a dry flesh, an essential attribute for winning over those averse to the unfamiliar moist and mushy texture of most orange varieties. Plant breeders from neighboring countries flocked to Dr. Mwanga’s research project in Uganda to learn about the super spuds. Additional funders came on board, including the Bill & Melinda Gates Foundation. According to the World Food Prize Foundation, today nearly two million households across 10 African countries plant or buy the nutrient-packed sweet potatoes. Researchers have organized groups of farmers to sell disease-free potato vine cuttings to other small-scale farmers. Public education campaigns promote the orange potato with t-shirts, billboards, and bright orange trucks. Food processors develop everything from orange sweet potato chips and donuts, to vacuum-packed sweet potato purée.